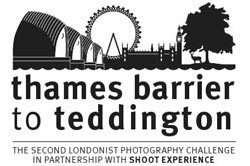 Thames Barrier To Teddington: Open Now! Lindsey Thames Barrier To Teddington: Open Now! The top 40 photos from our summer photography competition are now hanging on the wall of the Gallery at Foyles. The exhibition is free and open during normal Foyles opening hours (check before you visit in the evening in case a private event is happening in the Gallery). Just go up to the 3rd floor and take a look. The Private View and Closing Party takes place on Friday 22 October between 6.30pm-9pm where we will announce which 5 photographs have been selected by our judges for special commendation and Londony goody bags. Come and mingle with the photographers, Londonist contributors, readers, friends and family and toast the talent of all the shutterbugs whose work made it to the wall. Thames Barrier to Teddington is at The Gallery at Foyles is on the 3rd Floor, Foyles, Charing Cross Road, WC2H 0EB until 2pm on Sunday 24 October. This exhibition is part of Photomonth 2010.